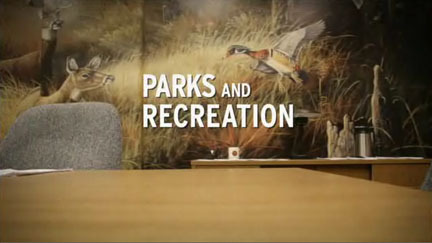 I’ve been shotgunning Parks and Recreation on Netflix recently. Most of it is new to me. Since the first season, I’ve only sporadically watched the show. Parks and Rec started when I was really into The Office (Season 2 of The Office is one of the best seasons a TV show has ever had) and the similarities on tone and format got me interested. However, that first season, not unlike The Office’s truncated first season, was kind of bad. The tone was all over the place, there was little rapport between the characters and it simply was that funny. They brought over the cringes from The Office but left out the laughs. When My Name is Earl got cancelled as the lead in to The Office, I felt fine ignoring the rest of the NBC Thursday night line up and just watching The Office. If I remembered it was on. That was an unfortunate decision, since that same fall Community got started. I’ve caught episodes of Parks and Rec infrequently since then, generally finding them to be pleasant but lacking a little punch. Still, I found them enjoyable enough to put the show in my Netflix Instant Queue. (which isn’t called that anymore, but who cares) Now that I’ve finally grown tired of endlessly rewatching Always Sunny, Futurama and Psych, I started up Parks and Rec. The first season is still not very good. It manages to get the characters set up, but there really aren’t any stand out episodes. Season 2, though, leaps to consistently excellent heights and the show stays there pretty much constantly from then on. At least parts of my sporadic impressions of the show were accurate. Yes, some of the individual episodes do lack a little punch, but the work a lot better when you have seen the surrounding episodes and a better idea of the running gags. That is true of any show, but Parks and Rec does a particularly excellent job of building a world for the show to inhabit. It is the other part of my impression that was most spot on. The show is pleasant. Parks and Rec is almost relentlessly pleasant. That is the shows defining characteristic, it’s almost absurd positivity. Despite facing nothing but personal and professional setbacks, the characters of this show always seem to be smiling. There are still the cringe inducing moments like The Office specialized in, but they are usually softened by some sweet moment only seconds later. Leslie Knope, star of the show, embodies this positivity most of all. She works a job that grinds everyone else down. They grow frustrated in their inability to actually accomplish anything through the bureaucracy and give up to either find work in the private sector or go about their jobs without thought or enthusiasm. Leslie greets each hurdle in her path like a gift, champing at the bit to fight her way through some red tape despite know that on the other side is simply more red tape. She’s not stupid or unaware, she simply enjoys her work. It rubs off on the rest of the cast. Anne, Tom, Mark and occasionally even Ron get swept up in her enthusiasm at times. Parks and Rec also manages to change its situations without affecting the premise. Character’s role change, but they find new ones, ones that just so happen to keep them with the Parks and Rec. April moves on from being an intern to being Ron’s assistant. Ann and Andy break up, but both of them are organically kept as part of the show. After the second season Mark leaves, but he is replaced by Ben and Chris, changing up some character dynamics but not fundamentally altering the show. The most remarkable facet of the show is how well it portrays friendships. All the characters seem to genuinely like each other. Leslie and Ann have possibly the best realized female friendship I can remember seeing on TV. They are not unlike Scrubs’ Turk and JD, though with less sexual tension. Once their friendship is established, sometime in the second season, they are always shown to be true friends. They may have disagreements, but they never let it come between them. Then you have Ron Swanson. He is undoubtedly the best character on the show, and despite his gruff demeanor is shown to be a true and loyal friend to most of the rest of the cast. He and Leslie have a friendship that transcends their diametrically opposed political viewpoints, often going well out of their way to help each other. He tends to take the younger characters, April, Tom and Andy, under his wing in various fashions. He supports Tom’s efforts as an entrepreneur despite finding him ridiculous. He enjoys April’s surliness and appreciates Andy’s unthinking zest. What is amazing is that a show that bases so much of its humor on its characters is how little comes from direct conflict between those characters. There is conflict between characters, both generally they are all working to the same goal. The humor comes from that fact that they work to that goal like a pack of cats tied to a dogsled, each one trying to go its own way and everyone getting nowhere. There is one big exception to this; April. While her bored cynicism is at least partly an obvious front, she is still fond of throwing a wrench in things just to watch them go wrong. She is the only character on the show that deliberately causes conflict. Nothing describes Parks and Recreation was well as pleasant. It is a happy show about happy people who are just trying to help. At this point, I think it has surpassed The Office as the better show. Its heights aren’t quite as high, (Seriously, The Office Season 2 is so great) but it doesn’t have the lows of that show either. I actually hate to compare the shows at this point, because while the similarities in tone, style and subject early on made them seem like carbon copies, Parks and Rec has morphed into its own thing. It appears that Parks and Recreation will be coming to a close after its upcoming 7th season. Now that I am just about caught up I am sad, but not surprised. That is a good long time for a show to run, and better that it ends maybe a touch early that staying on too long and becoming a terrible shadow of itself. Or even worse, for the show to lose the pleasant nature that makes it so enjoyable to begin with.